Homes, businesses, government offices and churches were among the buildings badly damaged or demolished when tornadoes struck central Alabama over the weekend. 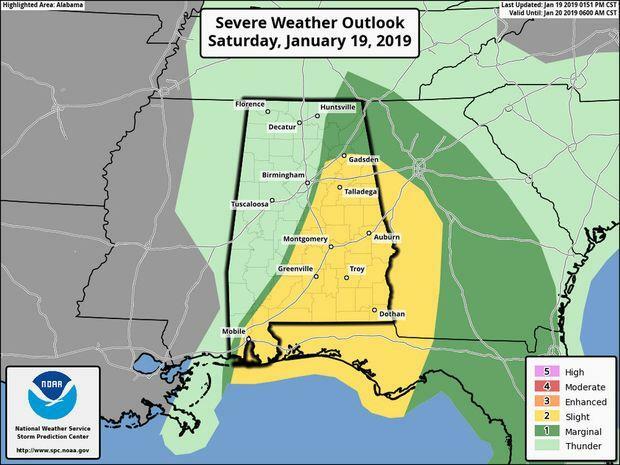 The severe weather hit Saturday and another tornado was reported later that evening at an air base in the Florida Panhandle. On Sunday, the National Weather Service says its initial surveys indicated there was an EF 1 tornado in Autauga County, and a stronger EF2 twister in Wetumpka, Alabama. "We suffered a tremendous amount of damage," Mayor Jerry Willis said at a morning news conference with city and Elmore County officials. "Something that we've never had here before." The familiar steeple of the First Baptist Church of Wetumpka was missing after the storm. And much of a historic Presbyterian church was reduced to rubble. Officials said at a news conference Sunday morning that at least 25 homes were seriously damaged or destroyed. Also severely damaged were the Wetumpka police station, senior citizens center and recreation center, according to WSFA-TV. "Thus far we've seen damage indicating wind speeds of 120 to 130 mph," John DeBlock, of the National Weather Service in Birmingham, said during the news conference. No deaths or life-threatening injuries were reported. Willis advised Wetumpka residents to avoid the downtown area as debris was being removed Sunday. There were no immediate estimates of the dollar value of the damage. Willis said that was being documented in anticipation of seeking federal aid. The Central Alabama Community Foundation is raising money to help Wetumpka storm victims. In the Florida Panhandle, authorities said buildings on an air base were damaged by a tornado early Saturday evening. Tyndall Air Force Base posted a message on its official Facebook page that no one was injured but that the tornado damaged structures and vehicles on the military installation. The air base was hammered by Hurricane Michael in October.